on the ecosystem and public use opportunities. 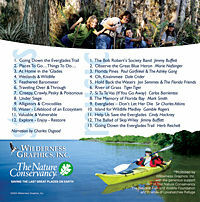 Take a hike on the Florida Trail! 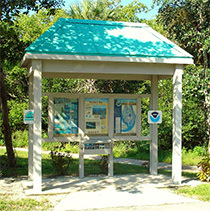 You can get on the Trail at several of the Everglades Trail sites. A two CD set, on sale at many of the sites, includes stories and music to accompany your journey. You'll enjoy listening - on the road or at home. 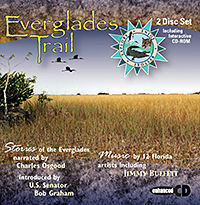 The Everglades Trail is a project initiated by Marvin and Lee Cook (then owners of Wilderness Graphics, Inc.), the Florida Chapter of the Nature Conservancy and the Friends of Arthur R. Marshall Loxahatchee National Wildlife Refuge. The Trail was introduced by U.S. Senator Bob Graham and created with the support of Office of Greenways and Trails, Florida Department of Environmental Protection and the Florida Department of Transportation Environmental Managment Office, with the assistance of Visit Florida and participation of local, state, and federal agencies. Friends of the Everglades has assumed interests of the Everglades Trail Association, Inc.
Disclaimer: The sites listed above are web sites that have information about the Everglades. By listing these sites on the Everglades Trail website, the participants and sponsors of the Everglades Trail are not endorsing any of these web links. Links, web addresses, or information contained on the listed sites are the sole responsibility of the sponsor of the listed web sites.